After a great start to the summer season, now comes the hard part! Improving on all those awesome times throughout the season. 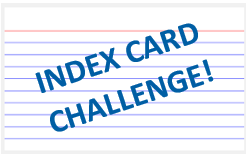 To help accomplish this goal, SDMS is doing an Index Card Challenge all summer. Any other goals in other events throughout season. If your swimmer didn’t swim in the first meet but is actively practicing (and/or returning from a family vacation), please still complete this card and set goals for their main events and any other goals. The best part? As kids reach their goals, we will have them update the cards. This means our athletes are always focused on improvement because their goals continue to adapt to their changing skills. This Index Card Challenge may seem like a small thing, but it’s been proven to make a BIG impact. We can’t wait to see your goals!